There are doctors... and then there are one in a million doctors who say things like, "Any monkey can write a prescription refill. I have years and years of schooling; I can write a plan!" That's Thomas Nasser, DO and co-founder of Antelope Valley Orthopaedic & Rehabilitation Specialists (AVORS) Medical Group way of summarizing his philosophy of care. The board certified physical medicine, rehabilitation and pain management specialist is known far and wide for his multi-modal treatment programs and emphasis on natural, modern solutions to pain. "The best thing I ever learned about maintaining and recovering health I learned from my mother. She had the RIGHT PERSPECTIVE and this is what I still share with my patients today: get enough rest, drink a lot of water, keep your stress level down, get plenty of exercise and fresh air, eat the right amount of good healthy foods." "The most powerful tool I have as a doctor is not my ability to give injections or write prescriptions. It's my ability to communicate care and show kindness to my patients and to creatively put together a comprehensive program for their care. I want to let them know that I'm deeply invested in their health and recovery. It's what makes me different than a lot of other specialists," says the expert. 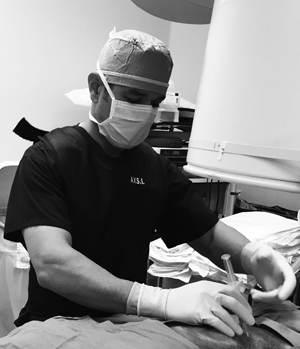 What also makes an incredible difference: Dr. Nasser's arsenal of non-invasive, proven treatments for pain and recovery. "I use meditation, yoga, tai chi, dietary changes, exercise plans... My patients make huge recoveries without always popping pills," he says. It's not that the doctor is opposed to pain medication; it's that he recognizes the inherent risks. "Pain meds are like guns. They are sometimes appropriate to use in the correct settings, but you shouldn't have either just sitting there in your pocket to use willy nilly. Both are dangerous and can easily be misused," explains the physician. "I work with my patients to use medications only when necessary, and we make a plan to transition away from them when appropriate. For patients who are already taking them, we work together to use them correctly or discontinue them," he shares. most importantly - pain free. Instead of - or sometimes in conjunction with - writing a prescription for pain medication, I often prescribe a specialized diet and/or exercise. I'm not opposed to pain medication, they have their place and I do use them on occasion, but when education and empowerment are so effective, sometimes there's no reason to take the risk,"
It all comes down to Dr. Nasser's guiding philosophy: "Each of my patients were born with everything they need to get better. It's already inside each of us. My job is to help identify how I can best tap into that and aid their recovery process. That's a very important role, which is why I wear a lot of 'hats.' I'm not just your doctor - I often find myself acting as a coach, counselor, scientist and/or teacher. Applying good diet, exercise, and stress control techniques, in combination with traditional medical treatment, is not only how I approach my practice to medicine, but it's also how I live my own life. What's good for my patients should be good for me." Dr. Nasser applies these perspectives to treating injuries and illnesses that affect how his patients move, focusing on nerves, muscles and bones. The expert at diagnosing and treating pain and dysfunction prides himself on restoring maximum health and quality of life to individuals of all ages suffering from arthritis, neck and back pain, sports injuries, amputation, stroke, brain and spinal cord injury and much more. This kind of care is what has made AVORS, now open in Valencia, such a success. The medical center, with four offices and a decade's worth of grateful patients, has cultivated a reputation for exceptional experiences.